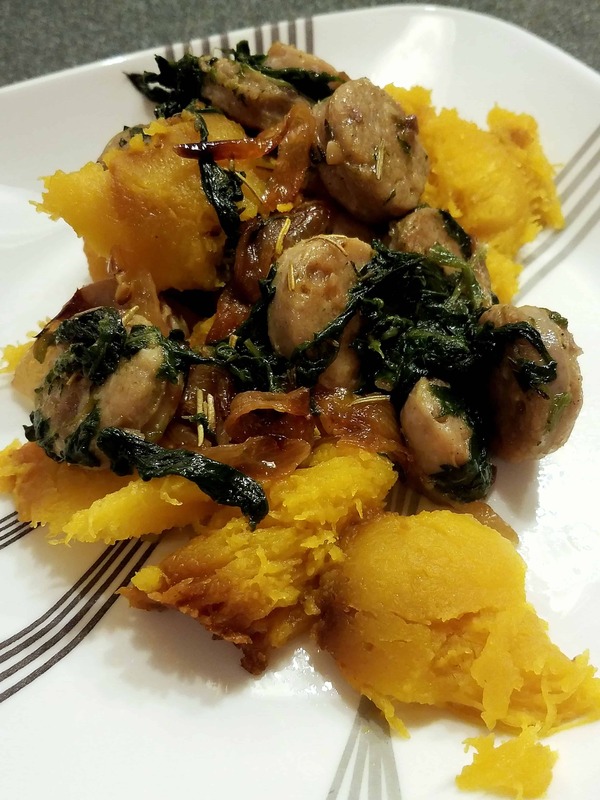 This dish is perfect for fall when both acorn squash and apples are in season. Be sure to use the fresh herbs, because they really finish off the dish nicely! Place the 4 acorn squash halves open-side down on the baking sheet and roast in the preheated oven for 20-30 minutes, or until the top of the squash pierces easily with a fork. Set aside after removing from oven. While the squash roasts, begin caramelizing the onions. In a medium skillet, heat the olive oil over low heat, and add all the onions. Stir to coat. Stir onions every 5 minutes to prevent burning. I like to add a little bit of water every now and then to keep them from drying out. Once the onions are deep golden brown, remove from heat and set aside in a heat-safe dish. Once the squash and the onions are finished, begin cooking and browning the sausage in the same pan used for the onions (you might have to add a little more olive oil). Add the spinach to the pan with the sausage. Cook until wilted. Make a well in the center of your sausage pan, and add in the garlic. Cook until fragrant. Add in the remaining herbs, salt and pepper, and the caramelized onions to the pan with the sausage. Stir until combined and then remove from the heat. To serve, scoop out the pulp from an acorn squash onto a plate, and top with the caramelized onion mixture. Top with diced apples. Alternatively, you can serve the caramelized onion mixture in the acorn squash half, and top with diced apples. Well that looks and sounds absolutely delicious. My son is a huge fan of sausages so I always look for new ways to incorporate them. Thanks so much for sharing! I’ve always loved the smell and taste of roasted onions and garlic in food. I’m sure that they add just as much taste to the squash. And I also don’t enjoy cooked apples so I’ll prefer them at the end but overally, this looks like a really healthy meal. I love the sound of the recipe here. I have most of these ingredients and it sounds like something my kids would like. This post has made me hungry.. despite the fact.. . I am way past my dinner time. Like that the recipe is using many herbs and Himalayan Pink Salt which is good for health! Just added the ingredients in my next shopping list. Would love to try it. That looks so delicious! IIt doesn’t look too hard either. I’ll have to try this! thanks for sharing your recipe! I”m lucky I have chips with me after seeing this delicious recipe. 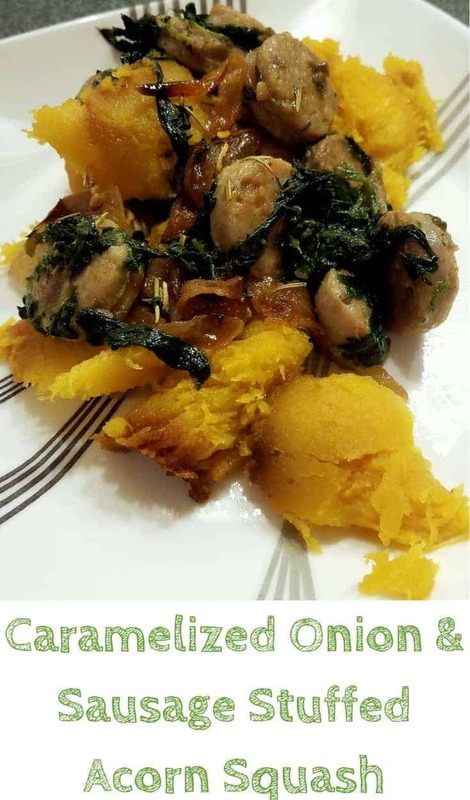 Caramelize onion is my favourite and on this recipe it’s perfectly fit with other ingredients. I bookmarked this because I want to try the recipe.